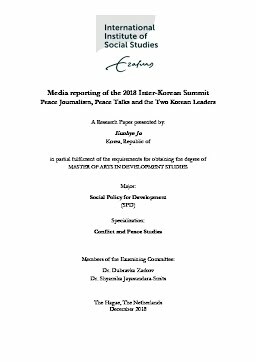 The research aims to examine the current South Korean leading media outlets’ English news articles which closely deal with the third inter-Korean summit (April 27, 2018). By examining textual and visual representation, the research attempts to read the mainstream media agencies’ socio-political standpoints provided to the public. Particularly, the research maps out media reporting based on 1) Stuart Hall’s Representation theory – which deconstructs the old definition of representation as to re-present and reconstructs it into what stands for; and 2) Peace Journalism theory, which considers journalists as proactive agents in the conflict/war situations who can create peace opportunities rather than concentrating on war and victory. Although Cold War-oriented journalism has been prevalent in the South Korean media environment owing to the Korean War, media workers have been striving to subvert the out-of-date biased journalism. In the context of North Korea’s pledge to the denuclearization process and the ongoing inter- Korean high-level dialogues, the research aims to read how the two leading media agencies present the peace dialogue to the international and domestic audience. The study makes use of framing and categorizing to analyze the reporting of the peace negotiations and the two Koreas’ leaders. Finally, the research seeks to provide policy lessons beyond peace journalism.